A recap of our 2019 winter . 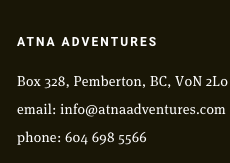 5 Days basecamping in the mountains with access from Pemberton. Lots of stormy weather and plenty of Pemby Pow. An excellent group and an exceptional time in the mountains.